The Reticulated Python is the world’s longest snake, and the longest reptile. 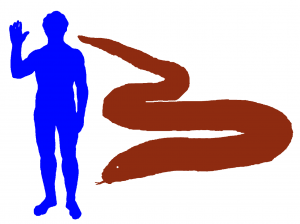 However, it is not the world’s heaviest snake. The heaviest snake in the world is Anaconda. The adult reticulated python can grow to over 8.7 metres (29 feet) in length. On average they grow to about 3-6 metres (10-20 feet). They are quite slim and slender. Reticulated means network and it refers to the colors and patterns on its scales. 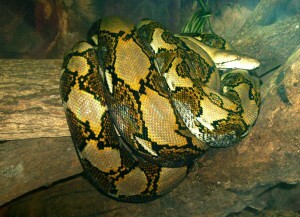 These colours and patterns allows the reticulated python to be camouflaged very well by the leaves of the rainforest. These patterns on the scales are a complicated geometric pattern with different colours. The colors can include light brown, cream, yellow, dark brown or even black. 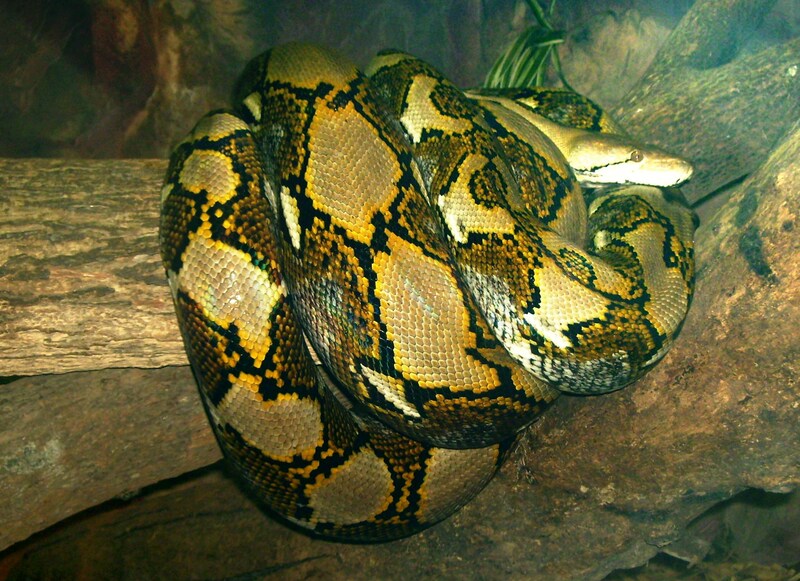 The head of the reticulated python is yellowish with a thin, dark line. Their bellies are yellow or white. They are not venomous, but they are great constrictors. This means they will coil tightly around their prey and squeeze it until the prey is unable to breathe. 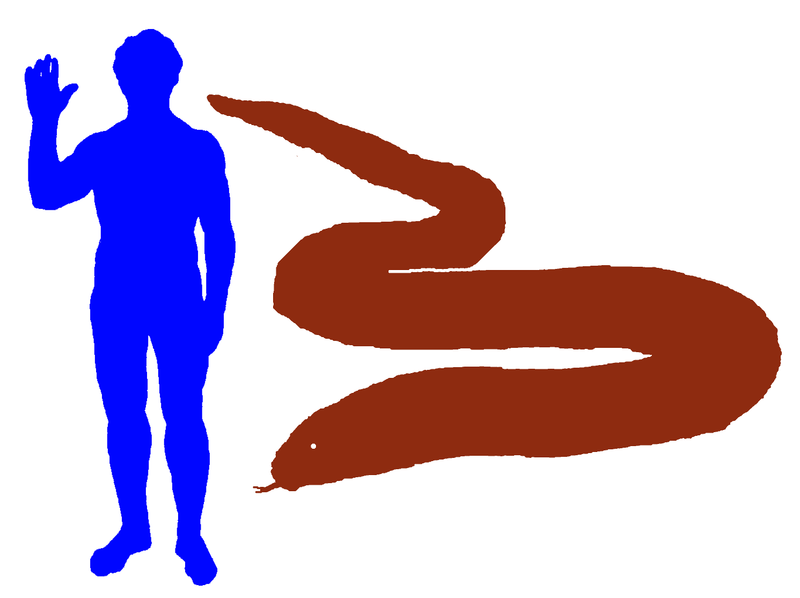 In January 21, 2009 a 3 year old boy in Las Vegas was coiled up by 5.5 metre (18.5 foot) reticulated python, until the poor boy turned blue. Fortunately his mother manage to save him by gashing the python with a knife. His mother was actually helping her friend to babysit the python! Never babysit a python unless you know how to handle it properly! Pythons do not normally attack humans, but they will still constrict a human hand if they mistake it for food or if the human threatens them. The reticulated python lives in rainforests. They love rivers, streams and lakes. They are great swimmers. You can find them far out at sea or even on small islands. They can be found in South East Asia from Nicobar Island (near Sri Lanka), Bangladesh, Myanmar, Thailand, Laos, Cambodia, Vietnam, Malaysia, Singapore and on many islands of Indonesia and the Philippines. They feed on mammals and sometimes they hunt for birds. They are meat-eaters. Small reticulated pythons about 3-4 metres (10-13 feet) long will eat rats and larger reticulated pythons will prey on pigs, ducks, deers and rarely humans can be part of their menu. If they are more than 5 meter long, they have the ability to kill and eat a human. The reticulated python is able to swallow animals which is larger than their own heads because the bones of their skull and the lower jaw are loosely joined together by ligaments. This allows the jaw and the bones to be opened widely as the prey is swallowed. Their skin can also expand. So, when a reticulated python swallows a pig, you can see a big lump in its body until the pig is digested. In short, these reticulated pythons can swallow a prey up to 1/4 of their own length and as heavy as they are. A female reticulated python lays between 15 to 80 eggs. The optimum incubation temperature is 31C – 32C (88F-89.5F). She will coil around her eggs and shiver, making sure that the perfect temperature is maintained. The eggs take an average of 88 days to hatch. The young pythons will crack the egg by cutting a slit in their eggshell with their egg tooth. The hatchlings are at least 60 centimetres (2 feet) in length. There is an increased demand for reticulated pythons because some people like to keep them as pets, Also, its skin is very popular for leather products like wallets, belts and boots and it is also hunted for its meat. The keepers of the reticulated python should have previous experience handling this large snake. If they are not careful, the python may escape from its cage and this will bring danger to the keeper, neighbours and other pets.